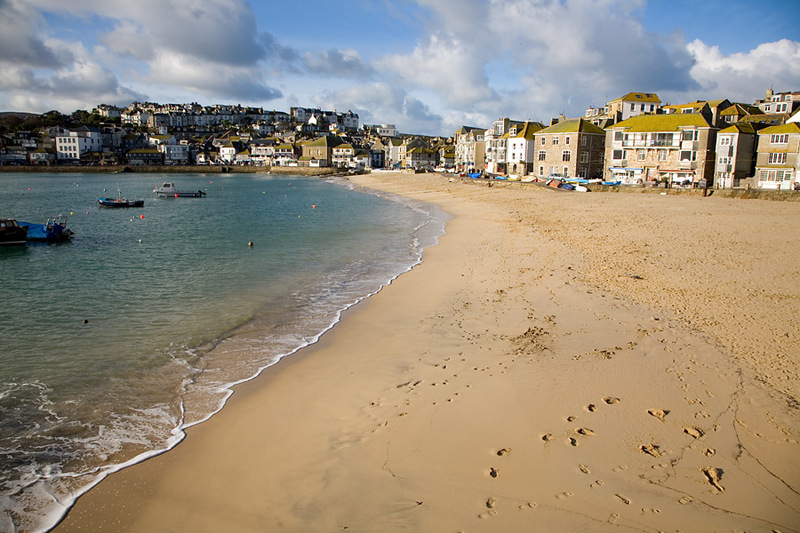 The town of St Ives has grown around its picturesque harbour since it was first settled in the 6th century. 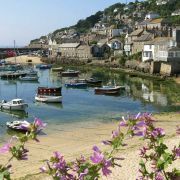 Once one of the most important pilchard landing ports in Cornwall the harbour would have been crammed full of fishing boats and the wharf side bustling with fish wives and traders. These days the harbour is still thriving and the quayside as busy as ever but fishing is no longer the main industry here. 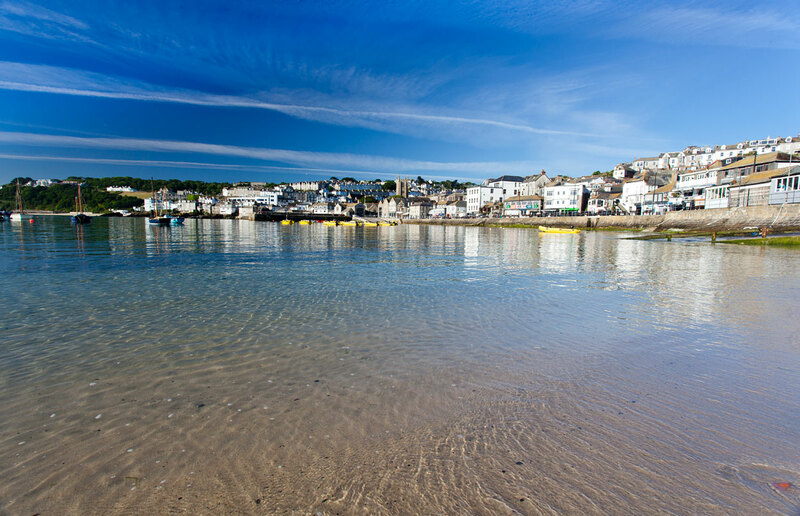 Despite the often overwhelming numbers of visitors St Ives harbour still manages to retain much of its charm and there is still a small fishing fleet. 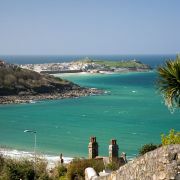 In addition there is much of historic interest to complement the beautiful views of the town and coastline beyond. As well as being a working harbour there is also a great, sandy beach here which benefits from being in the middle of all the amenities of the town. 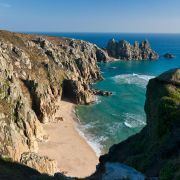 The beach is sheltered from both the seas and the wind making it ideal for families and sunbathers alike. The northern corner by the arches of Smeaton’s pier is particularly sheltered and a veritable suntrap. At low tide the beach joins up with Porthminster beach to form about a mile of sand. 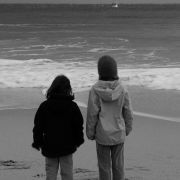 You can even walk out past the end of the pier and around the corner to the elusive Bamaluz beach on some low tides. 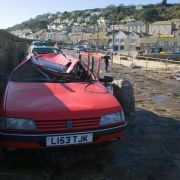 The harbour beach backs on to the Wharf and Wharf Road which runs parallel to the town’s main shopping street Fore Street. 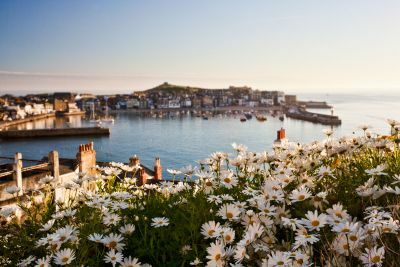 In the summer this is thronged with tourists drawn to the harbour and the range of cafes and shops that line the harbour front. The cafes tend to be better towards the church end of the road with the Alba and Hub being worth a mention. Towards the other end the food gets faster but it I’m happy to say at this time none of the big names have opened up along here. 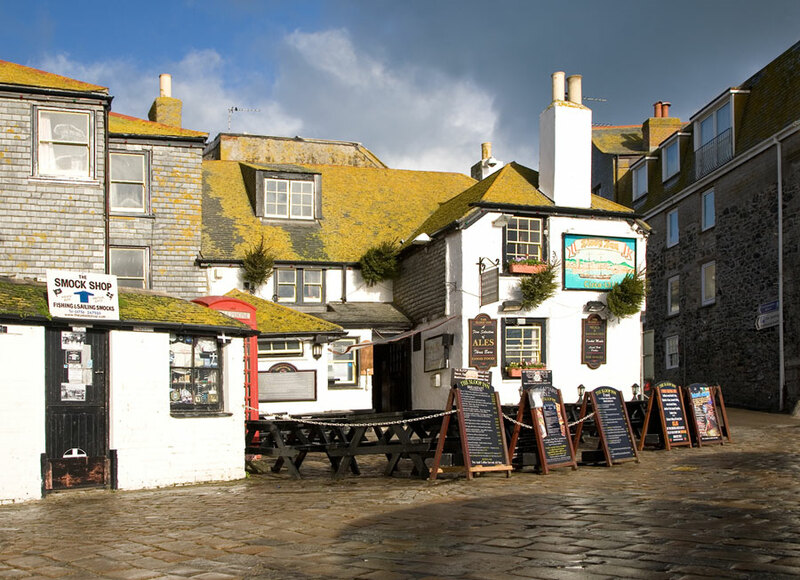 About midway along the harbour front is the Sloop Inn, reputedly one of Cornwall’s oldest public houses. It is said to date back to the 14th century and has been the haunt of fishermen ever since. It is still popular with locals and you’ll have trouble finding a table outside on a summer evening. Smeaton’s pier is located the northern side of St Ives harbour and was constructed between 1767 and 1770 from a design by the eminent civil engineer John Smeaton. The pier was built by dumping rubble onto the seabed and then building the walls around this core. 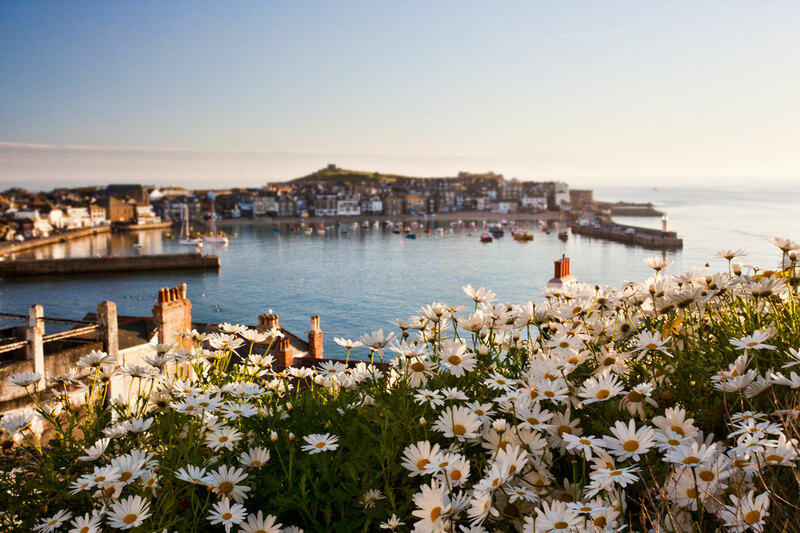 Smeaton’s pier was originally 360 feet (120 metres) long with the elegant Smeaton’s lighthouse sitting at the end. However, in the 1890s the pier was extended to almost double its length and a new lighthouse added. The 3 arches at the landward end were included in the 1890 modifications to the pier and intended to allow the circulation of seawater and thus prevent the build up of sand in the harbour. Whilst these were reasonably effective in their task times have changed and now-a-days sand in the harbour is seen as a positive. 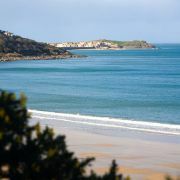 As part of a plan to expand the harbour a wooden pier (Wood Pier) was constructed in 1864 very close to Smeaton’s pier. All that is left of it now are the 2 rows of supporting timber stumps. It survived for around 20 years before being claimed by the sea. There was a pier at the current location many years before Smeaton built his. The diminutive chapel of St Leonards is testament to this and has stood at the base of the pier since medieval times. The chapel is where fishermen would pray before setting out to sea. It is said a proportion of their catch was paid to the chapel friar on their safe return. 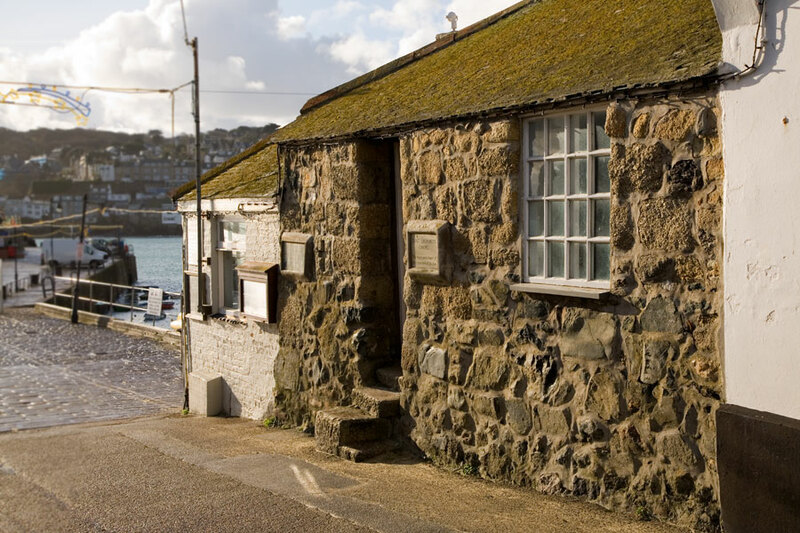 Now-a-days the chapel contains a collection of model fishing boats and a memorial to St Ives fishermen who have lost their lives at sea. At the southern side of the harbour, near the church, is West Pier. Built in 1894 this is much shorter than Smeaton’s pier and has not had to withstand quite the same pounding from the ocean. 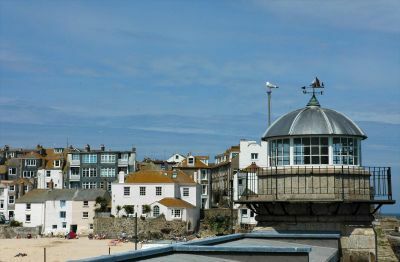 At the base of the pier is the new lifeboat house; originally the lifeboat was housed at Porthgwidden beach around the corner. In 1867 the house was moved to Fore Street from where the boat had to be wheeled through town before being launched. The process is still a little cumbersome as can be seen from the photo sequence here showing the St Ives lifeboat launched using a submersible tractor. In 1939 the crew of the St Ives lifeboat made the ultimate sacrifice going to the aid of an unknown vessel. The lifeboat capsized 3 times to in seas off Clodgy Point and out of a crew of 8, only one managed to stay aboard and get to shore near Godrevy several miles up the coast.